So I went from my hotel to Bursa's bus station. The bus system in Turkey is outstanding. Each city has a well-organized central bus station. Feels like 100 different bus companies fight about passengers, which makes the prices low, but the confusion is great. If you inform you about the prices in advance, you get it quite well. For larger cities like Bursa these bus stations are located outside the city, but they always have a relatively good connection to the city center. At least that was the case so far. 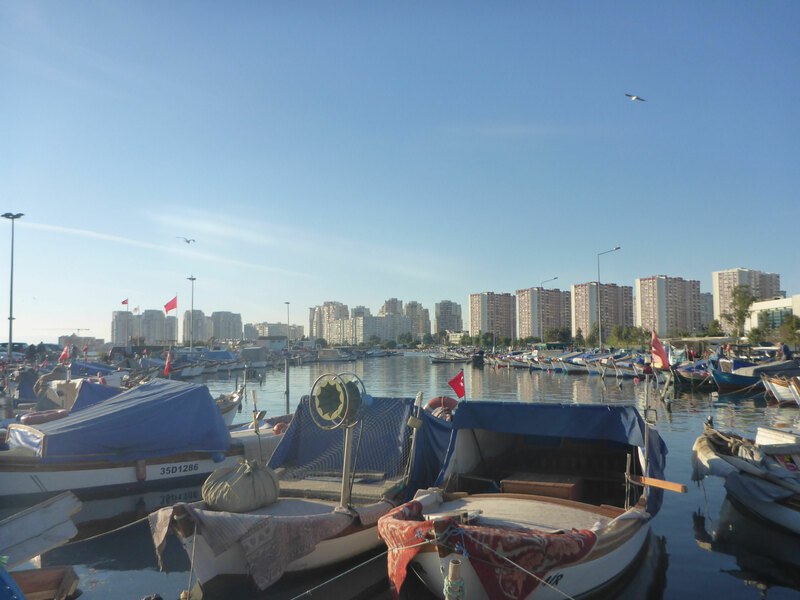 In Izmir, I was overwhelmed and the people I was able to speak to, did not really want to help me. After hours of driving I finally decided to go for the most expensive variant, a taxi. The hostel in Izmir was very nice, with a small garden and a well-located fountain in it, it was like a small, cozy island in the middle of the million-town. The breakfast there was very nice, and offered a large selection of Turkish specialties for a couple of lira. It was exciting, that the hostel guests are almost all long-distance residents. Erasmus students, workers and voluntary service staff. 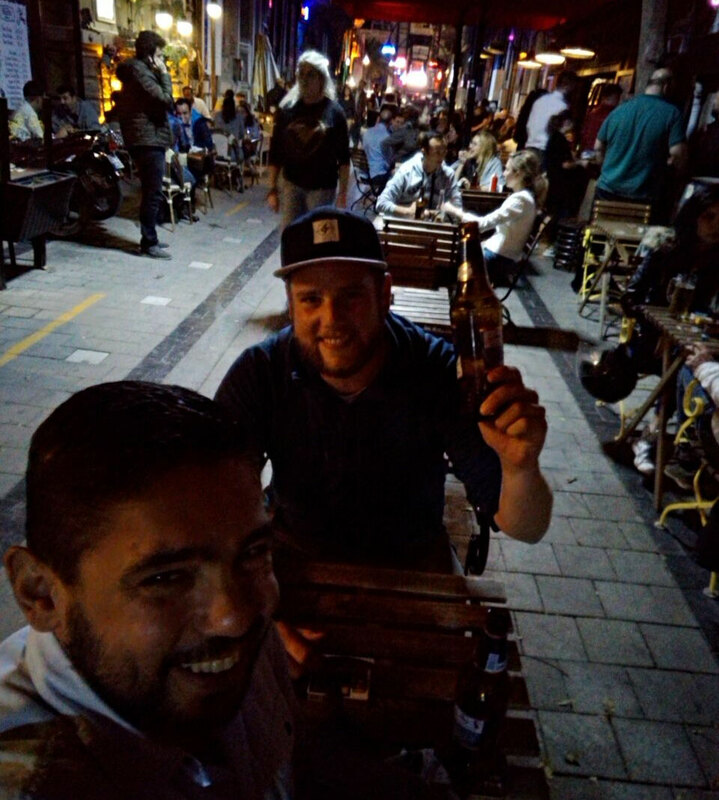 I was almost the only backpacker who came to Izmir for his personal pleasure. So it was the next days again to organize and think about my plans by myself. 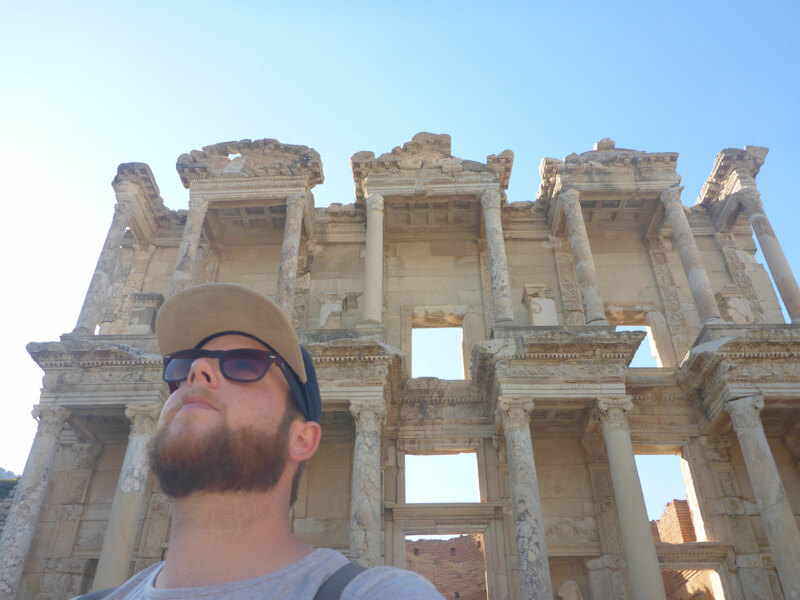 Before exploring the city, I used the location of the hostel near to the train station to take the next morning train ride to Selcuk, about 80km away, to visit the most famous sight in the Region. From the station there was a 4-kilometer march through the beautiful small town to the excavation site of the Greek-Roman-Byzantine site of Ephesus. 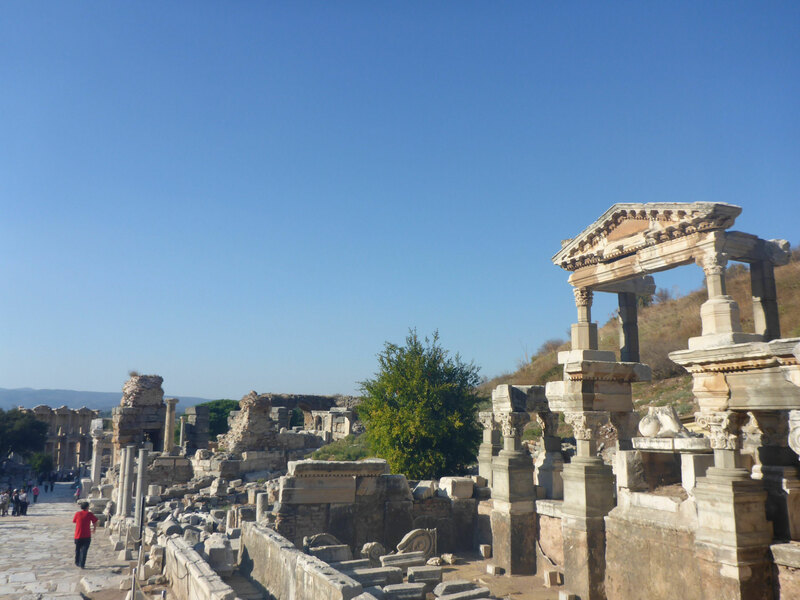 Ephesus was one of the metropolises of antiquity and with an estimated 250,000 inhabitants roughly comparable to today's Braunschweig in Germany. Opinions vary among experts, but the estimate is based on the size of the city's theaters. It is assumed that for 10% of the inhabitants a place in the theater was available. This is one of the largest ancient theaters of history with a legendary 25,000 seats. Very impressive and for me as a theater lover also very exciting. Again I booked a private tour. I like to invest in a person that helps me to bring the ruins to life in my mind. I would have liked to share this with a group, but I was apparently the only one who was not traveling with an organized tour group or audio guide. 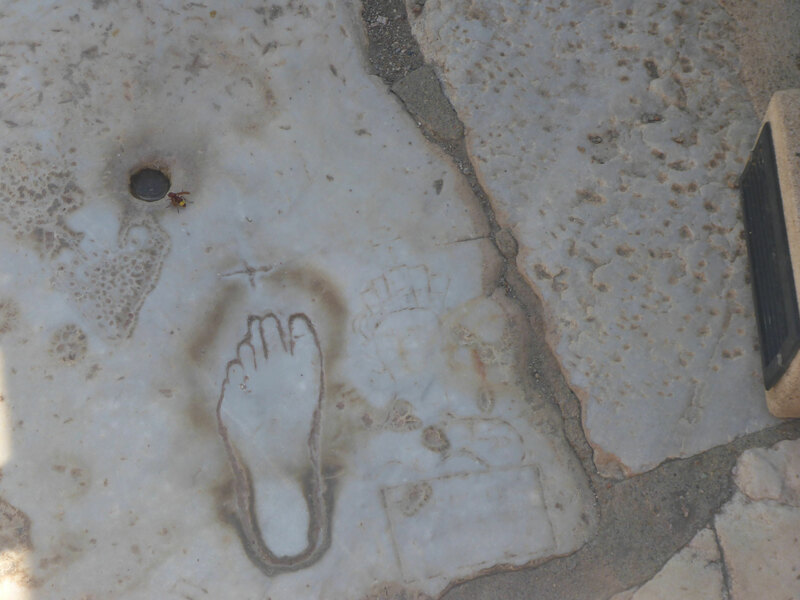 Exciting from marketing point of view, is the very well-preserved guerrilla advertising of an antique brothel, which was scratched in the marble floor in front of the theater, including directions and costs. Overall, those brothels were very smart. In addition, they had set up a secret tunnel below the library, so the men could tell their wives to read. The oldest trade in the world knows its target group, of course. The library, just mentioned, is, besides the theater, the best preserved, restored, and most famous piece of history here in the gigantic archaeological area. The three-store Celcus library, with its ornamental entrance facade, gives a good impression of how the metropolis must have looked. By the way, the famous Turkish beer "Efes" is named after this place. Also fascinating is the fact that this former harbor town is now no longer by the sea. The mooring points are still to be seen, however, the river has carried the coast for 8km from the city. 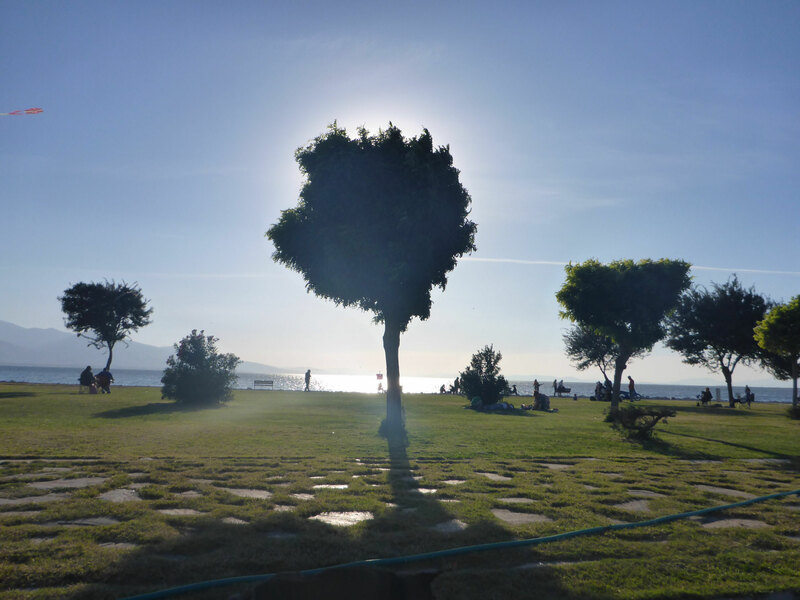 After spending three hours exploring the city up and down, I went back to Izmir. I would have liked to visit the ruins of one of the seven ancient worlds, the gigantic temple of Artemis. This is a few minutes’ walk from Ephesus, but there is almost nothing left of it. A field with a restored column. I saved that. 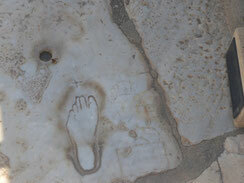 However, there is still a lot of interesting history to be exploring in and around Selcuk. I would like to come back here. That same evening, I got in touch with Osman (TR) of Izmir Free Tour. In many cities around the world, these tours are offered by people who would like to promote their hometown and to get to know travelers. Sometimes donation-based sometimes not. 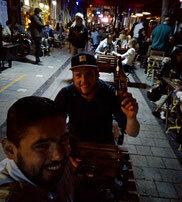 Osman runs such an offer and on the same evening we met for a beer in the hip district Alsancak. A funny guy and incredibly generous. He invited me to dinner and we planned our joint tour for the next day with a cozy beer in the party district of the city. Osman grew up in Izmir and works as a translator and interpreter. Finally someone who speaks really good English. The Turks, unfortunately, do not have the same foreign language. I had expected differently. But with hands and legs I can communicate quite well. A good exercise for Asia. 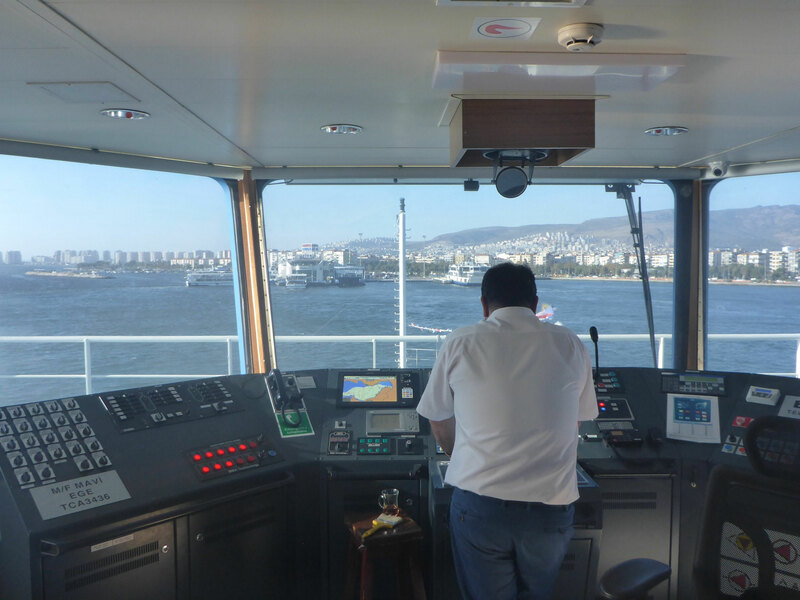 To the end, Osman invited me on a cruise through the gigantic and beautiful bay of Izmir with the ferries. enormous influx. The last warfare of the revolution was undertaken in the same place to send the Greeks from the mainland back to the islands. The city was almost completely destroyed in the early 19th century. Fortunately, I could easily reach my night's destination from the station, which is around the corner of the hostel. From Izmir it took 4 hours by train to Denizli. Somehow crazy, that in Turkey the train is the cheaper alternative to buses. You are not used to this in Germany. 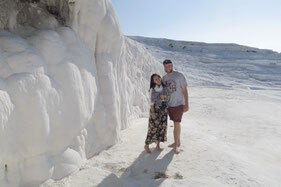 Denizli accommodated me only a few hours, because then a started with a minibus to one of the main attractions of Turkey. 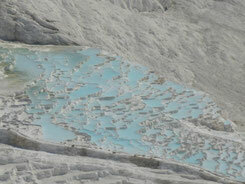 Pamukkale, which means "cotton castle", is a natural wonder that can only be found three times in the world. 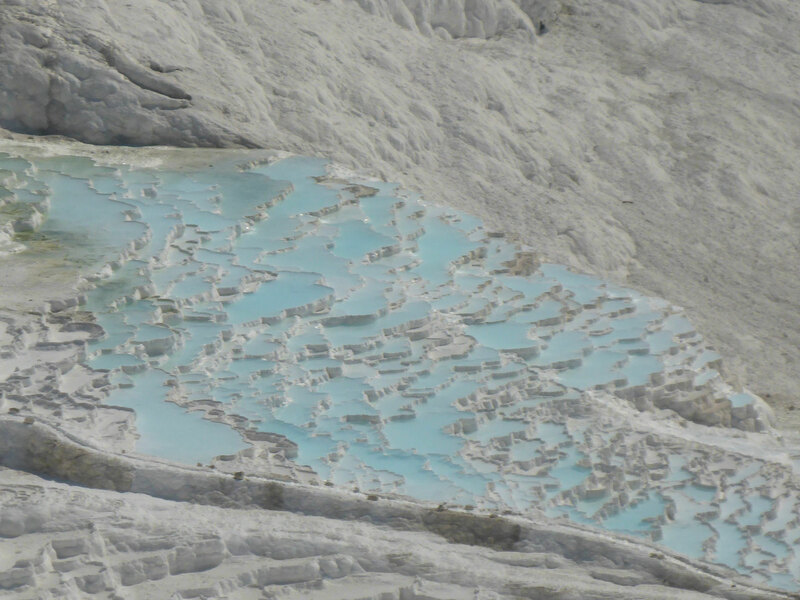 The calcium carbonate-containing thermal water spurted for thousands of years from the hot springs and by cooling on the surface, the water became saturated, lime sedimented and fabulous formations. Unique terraces and small pools, covering the slope of the hill snow-white. Lime sintered terraces is the correct term for this. Of course I did not want to miss this and so booked three nights in a dormitory of a hotel. But as expected, also in the small tourist village there was nobody. No roommates and the village was, except for a few tourist buses which brought mainly asians for one day, sadly extinct. But what really pleased me was that I was expecting a package at the hotel. The charging cables that Mo had sent me from Germany arrived and I was finally able to make backup copies of my pictures again, run a little banking and make stuff which needed to be done (like the travel reports). So I could use the time without roommates meaningfully. But one evening, I actually got a late night visit. 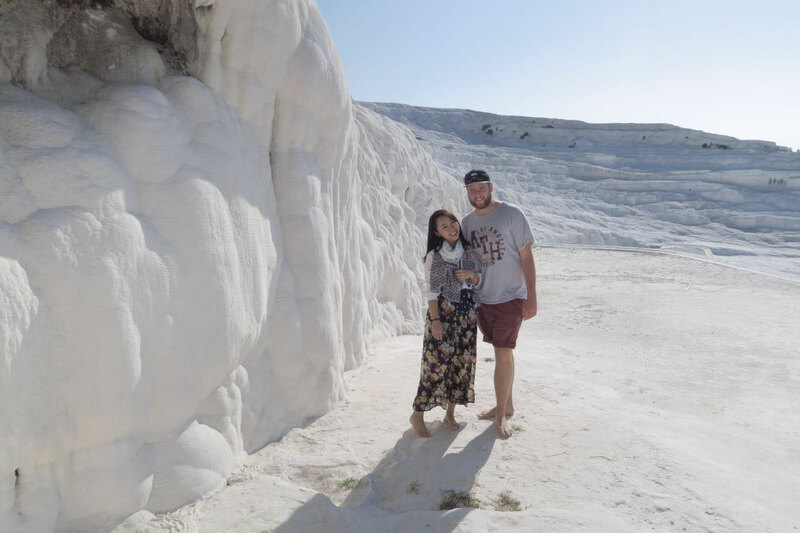 Together with Yinger (CHN), who unfortunately only took a short stop there as a backpacker, I was able to spend a wonderful day in the lime sintered terraces and the ancient city of Hierapolis, above the terraces. To be quite honest, I had imagined the lime sinter terraces somewhat more enormous. But that’s what the professionally shot and edit pictures of the tourism industry is doing. If I had expected nothing, it would probably have been better. Because they are unique, unusual and worth seeing. 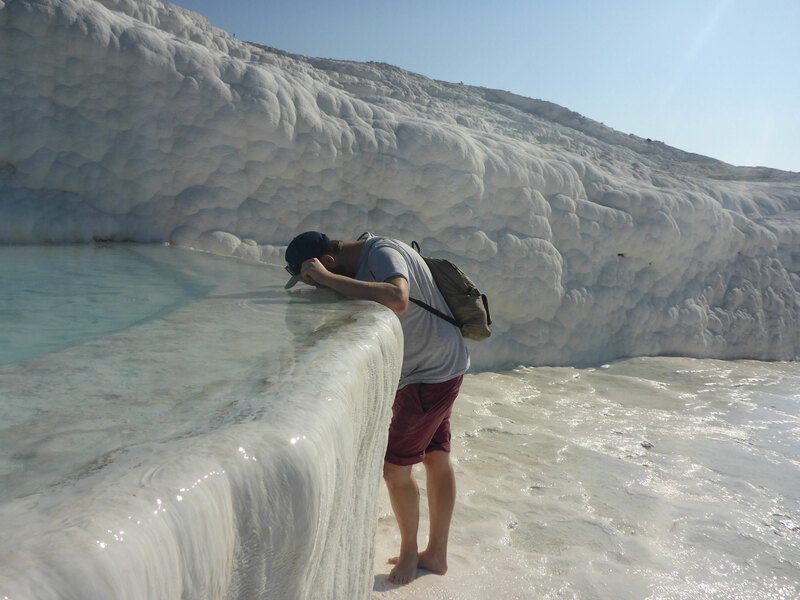 What also disappointed me, was that some thermal water channels were closed (I could not find the reason unfortunately) and thus many of the pools and terraces led no water. But don’t care. Yinger and I had a good time. You could feel perfectly how warmer the water on your feet got, the higher we have risen towards springs. Some visitors even bathed in the pools or the canals. In the excavations of the city of Hierapolis we visited - of course - the great theater and enjoyed the panorama over the lime terraces and the plain of Denizli. After I had really seen everything in Pamukkale and Yinger traveled to Egypt, I also packed my stuff to go more south as well. For me it`s time for the sea again. The south coast of Turkey offers incredibly many destinations. It would be difficult for me to decide myself. That is why I simply decided to leave this decision out and leave a Turkish friend to decide. So for me, it's Fethiye. 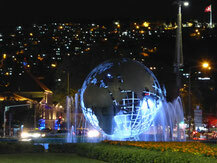 As just described, there is really so much to see ... anywhere in the world. I might have expected to stay 3-4 weeks in Greece. It took 3 months out of it. It could have been years without problems. Finding the good compromise in travel speed is difficult and different for everyone. It is very challenging to emerge from the learner's pressure and goal-oriented system and live without many conditions. I had to learn (and still learn) the pressure. At the same time, I can neither see everything, nor move forward quickly, nor relax, nor stay healthy, nor know people, nor experience uniqueness. It is not everything possible. Point. A lot of people ask: "Were you here? Were you there? Did you do this? Why not? Why there? This is a compulsory program! "And so on and so on ... I am firmly convinced that even if you would travel for two whole years only, with endless finances, you could not see everything and experience what to see and experience. I have to keep this in mind. In order to deal with cultures, exchange individuals and experience self-esteem, you really need to take this self-imposed pressure out. Only then you have the opportunity to become open-minded and inquisitive. And those, I think, are the two most important characteristics of a traveler. In support of this I decided not to read travel guides anymore and only to travel on recommendations from real people. This saves much grief. But everyone has to decide for themselves. Doing what your body and mind does well. Do what you want to do, and let your feelings and your chance lead you. So you always find one of the many available perfect destinations, times and experiences. Done. The next report will tell you how feeling and coincidence in Fethiye will affect me. I am very happy that you take the time to read my report. I hope you like it and I am all the more pleased when you are part of the team! - As a son of a soldier, Osman is part of the "Army Family" and gets so much benefits. But somehow funny, as he always called the army as a "family". 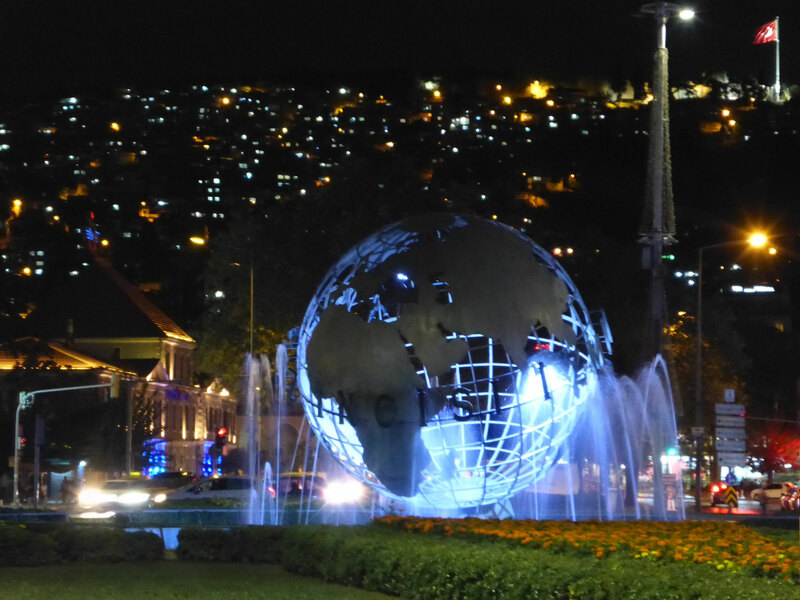 - The clock in Izmir's landmark, the "Clock tower", is a gift from Germany to the revolution. She had been running all the time. Until July 15 this year. In demonstrations, rioters have destroyed the clock and it is now in repair. - When Ying arrived, she disappeared in the bathroom and came out with a deep black facial cleansing mask. I was really frightened. I did not expect that. - Really expensive breakfast in Pamukkale. Had the first morning forget that breakfast was included in the hotel. - In Pamukkale you can probably eat Chinese more often than Turkish.